[Updated for 2013] Look, I don't like coffee flavored anything, never had, never will. I use to complain to my mom when Arby's would mess up and give me a mocha shake. It's just not for me... but Weight Watchers was nice enough to include these in their free sampler pack, so let's take a quick look at them. 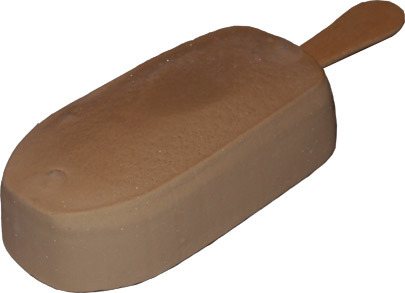 So we've got a box of 6 Giant Latte ice cream bars clocking in at a respectable 4 oz a piece. Notice the coffee beans holding up the bar. They are described as low fat coffee flavored ice cream and now have a new creamier texture with the same great taste. I never had the old ones, so I can't really tell you how much they've changed. And here is the mighty looking bar that smells an awful like coffee. I mean, my coffee knowledge is so weak that I had to go look up that Latte is a mix of espresso and steamed milk... but then I had to go and remind myself that espresso is basically concentrated coffee (is that a fair way to say it?). Anyway, I manned up, took a big bite, and then made that funny face that my son makes when he takes his vitamin. I do not like this treat. It reminds me of that time I tried to be funny by eating a coffee bean (I think that ended with that same funny face as well). Now I am 100% biased and untrained here, but basically it has that real dry coffee bean taste. If I could get away with saying flavor is gritty, then that's what I would say here. I handed the treat over to my wife who was much more open minded and said it's not bad (for a coffee bar). She was definitely hit with a lingering coffee aftertaste, so I guess the moral here is that this is no mild mannered mocha bar, this is straight up lively latte (just like the box says). I am a big coffee ice cream fan, but I thought these were not that good. Although they do have a distinct coffee flavor, they got boring very quickly. Historically they have tasted better, I think they changed something. Now they taste a little off. 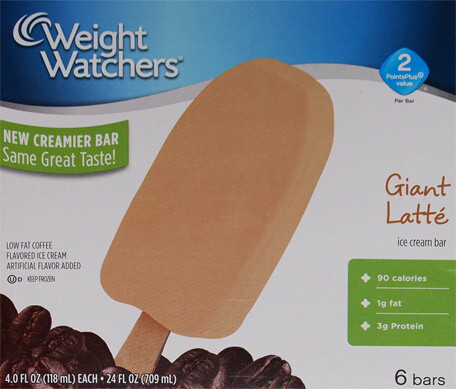 I am totally addicted to the Weight Watchers Giant Latte Bars. Forget weight watching - I eat at least three a night!! They taste divine and have the creamiest texture! My favorite icecream dessert of all time! Does anyone know how much caffeine is in one of these Giant Latte bars? I am sensitive to caffeine becausae it can trigger my afib. Love this bars but could not find them at Winn Dixie or Publix this weekend. Wassup7? They better not be discontinued!! Cannot find the latte bars anymore at Publix, Wal-Mart, Target for about a month now. We love them, hope they are not discontinued. To the person that said you can't find the latte bars at Publix, Wal-Mart, Target, etc., no, Weight Watchers has not discontinued those bars. We had the same problem in Tallahassee, FL. I was told that they weren't great sellers so the powers that be decided to quit carrying them. Personally, I think they were best sellers because they no sooner put them on the shelves and they disappeared. They probably just got tired of ordering and restocking them so often. Since I am totally addicted to them, and was going through withdrawals (not really - LOL! ), I went to Publix, and placed a special order for them. You can buy them by the case (8 boxes per case - 6 bars per box). It helps to have a chest freezer though! Hope that helps! A friend of mine has been raving about these, so I sprung for a box. I ate on and she'll be getting the rest of the box. Coffee/chemical taste and a synthetic texture. I'd rather have a real ice cream treat once a year than one of these every day. I am not overweight, but the giant latte bars were my favorite treat. I bought at least 2 boxes a week for myself. I can't believe they were discontinued. I bought the new swirled minibars, because they were the closest thing I could find. I hate them. I agree with the previous comment. I'm so sad that the giant latte bar seems to be discontinued. PLEASE bring them back!!! I really like the latte bars. They are also my favorite snack. and the chocolate ones are 3.
disappearing quickly doesnt necessarily mean high demand. It means there is more demand than supply, but if it was really high demand, they would keep it stocked if possible. I'm sorry everyone misses these so much. The new (tiny!) flavorless mocha swirls are insulting to this coffee lover. I agree: WW, please bring back the latte pops! I loved the latte bars. They were so creamy and satisfied by ice cream cravings. And all for only 2 points. I do not like the new mocha swirls--not creamy and not the intense flavor I like. I love them! But I'm a big coffee fan I love a good strong cup of joe!